The Nolli map is composed of 12 nearly equal-sized plates, each measuring approximately 80 cm by 54 cm with the assembled map at 176 cm by 208 cm. Numbers are indicated in the upper corner margins in each plate that were to have been used as identifying page numbers for the publication of the map in bound format which never materialized. Using the conceit of a scroll curled up at the edges, the map itself is clearly distinguishable from the entourage and frame. The border consists of decorative elements and medallions that are regularly interspersed with the symbols of the 14 Rioni defined by Bernardini. The map’s entourage includes various figures, buildings, inscriptions, and the like, each of which is precisely rendered to evoke actual places or particular ideas and symbols. The modern theme in the opposing corner includes a living personification of Rome receiving the Papal tiara from airborne putti, the entire scene framed by modern buildings most prominent amongst them being the Campidoglio, St. Peter’s Basilica, and S. John’s in the Lateran. The juxtaposition of left and right sides suggests a knowing awareness of Rome’s pagan past and Christian present and, with the figures and building symbolizing antiquity in ruins, it conveys the notion of a triumphant Church over paganism and a similar accession of the modern world over the ancient now crumbling into ruins. The putti that cavort throughout the lower portion of the map are highly instructive. 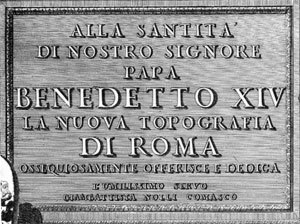 The first on the left is carving the papal coat-of-arms of Benedetto XIV. The putti in the center are focusing on a bussola (magnetic compass), noting, as in the wind rose on the map, that the city plan is oriented according to magnetic north rather than astronomical north, a significant detail reinforced in the map itself and an important clue as to the surveying techniques used by Nolli. The group of putti to the right are shown busily at work surveying the city with the foreground putto using the alidade and bussola on a plane table to orient drawings and to render precise sight lines. The chains in use by the putti in the background are the same used by Nolli and his team to measure distances used in triangulation. 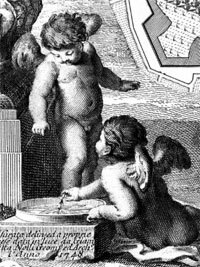 Left: Putti illustrating the use of the compass, or bussola. 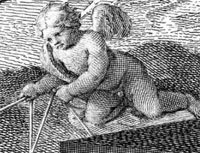 Below: Putti using a system of chains to measure distances in the city. An architectural scale in front of the dedicatory pedestal shows the Roman Palmo, the traditional unit of measurement in Rome which measures 223.4 millimeters or approximately 8.75 inches. The scale of the original map, is approximately 1:2,900. The engravers of the map are noted on the edge of the scroll and include Nolli’s son, Carlo, Rocco Pozzi Romano and Pietro Campana da Soriano. Stefano Pozzi Pit. impr. delin. There is a small "avvertimento," or notice tucked into a far corner of the map which explains the significance of the wind rose and distinction between true north and magnetic north. Cartographic symbols on the map proper are, for the most part, intuitively easy to understand: dark gray hatching for modern building fabric, white for open space. Ancient monuments are rendered in darker gray or black indicating extant ruins, while a white outline suggests hypothetical plans of ancient monuments that no longer exist (famously Nolli incorrectly speculated about the orientation of the Theatre of Pompey rotating it 90 degrees off it true position). A series of textured s-shaped curves are used to indicate contours or slopes (contours were not in common use until the turn of the 19th century). In addition gardens (and a variety of differing plant materials and cultivation patterns are noted), paving patterns, the river (and its direction of flow) are all carefully rendered. Various cartographic symbols are used to indicate a variety of features that would otherwise be difficult to convey. 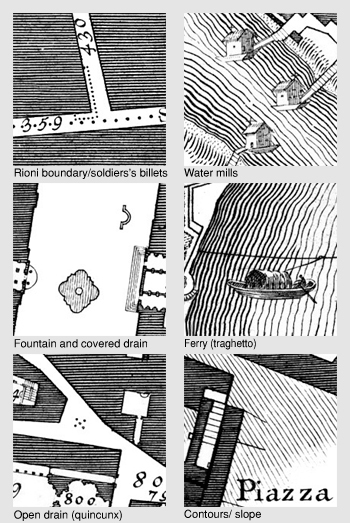 These include drains (open and closed), soldiers’ billets, apertures in the Aurelian wall circuit, cemeteries and the separating boundaries between Rioni (dotted lines). In addition pictorial elements are used to represent river craft which includes at least two basic types: the ferry boats with tethering lines as well as cargo craft used to navigate downstream toward Ostia (at the Porto di Ripa Grande) and other similar craft working their way north from the Porto di Ripetta. Molini or water mills are clearly shown proliferating in the rapids near the Isola Tiberina. Beginning with Monti, Rione I (S. Stefano Rotondo with its cipher-like plan is perhaps fittingly the first site) and ending in the Borgo, Rioni XIV, next to another circular plan, the Castel S. Angelo. Each number corresponds to its corresponding textual index published in separate folio sheets. In addition each site is noted in an alphabetical list of 19 building types with overlapping categories in over one hundred cases (about 100 sites fall into two or more categories such as the Pantheon which is listed both as church and as ancient monument). Beyond graphic symbols and keyed numbers Nolli uses textual labels to indicate additional sites in two ways. First to provide designations at a large city scale he uses large type to indicate the hills of Rome and Rioni. Smaller type is used for city gates, villas, gardens and the like, mostly in the disabitato area where there is room (graphically speaking) to write things out. Sometimes, perhaps for emphasis, Nolli indicates some sites using both numbers and textual labels such as Terme Diocleziane ora Certosa (NN203). The resultant document is a wonder of information that combines a sophisticated iconographic schema, a precise technical scale and accurate north arrow, illustrative cartographic symbols, detailed numerical indices and textual labels that provide an exhaustive explication of Rome and its social, artistic and scientific context.